Carrying along a laptop to download and back up all the photos snapped from your digital camera can be a big hassle when you are traveling or going on an expedition. Since you can’t afford to lose your hard work especially images which are shot for work purposes, devices such as HyperDrive Album perhaps can give you a fast, reliable, yet compact and affordable solution. Measuring 6″ x 3.5″ x 1.2″ (153 x 88 x 30 mm) in dimension and weighing only 14.1 ounce (400g), the compact and tiny image storage tool is designed particularly for shutter bugs on the move who need large storage to store and back up their images conveniently. Users can enjoy fast download speed at UDMA 40MB/s to back up their images. HyperDrive Album can back up 2GB memory within a minute. 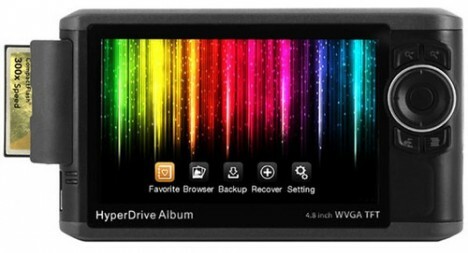 This storage device also features a 4.8″ high resolution widescreen VGA color LCD display (800 x 480 pixels) for users to preview and manage their shots instantly. Users can copy/cut/paste/delete, create new folders and sort the file directory by name/date/type. Sanho HyperDrive Album is powered by a rechargeable lithium-ion battery. Users can enjoy up to 200GB of download before the next charge. The battery is easily rechargeable via AC adapter, USB and even 12V car charger. Sanho HyperDrive Album offers various storage capacities, e.g. 160GB, 250GB, 320GB, 500GB and 640GB sizes. The hard drive capacity is upgradable in the event users are short in storage. This device supports all types of photo/RAW image formats and offers incremental backup. The device can skip data that was duplicated and copied previously when backing up new data in the memory card. Sanho HyperDrive Album also offers S.M.A.R.T. (Self-Monitoring, Analysis and Reporting Technology) that monitors internal hard drive for potential problems. The devices feature CF/SD slots with full speed support for CompfactFlash UDMA 300X and Secure Digital (SDHC) Class 10. This tiny device’s price range is from $350 to $600 depending on the hard drive storage.